To explain why, we need to tie together two parts of the story of modern Asia. The first is North Korea’s development of nuclear weapons, in particular the fact that Pyongyang is on the cusp of deploying an intercontinental ballistic missile, or ICBM, if it hasn’t already. North Korea’s ICBM is a devilishly difficult problem for America because it has the potential to split the US from its allies. The second part of this story is China and its rise to regional superpower status. China is the leviathan in this story, and the core reason behind America’s increasingly perilous place in Asia. North Korea’s ICBM merely exacerbates this change, and threatens to initiate a collapse in America’s position. Experts still disagree about whether Pyongyang can now reliably fire a nuclear-tipped missile with the range to hit cities in the continental US. North Korea has staged just three ICBM tests, and we can’t be sure it is capable of miniaturising a nuclear warhead to fit in the nose cone of such a missile, or that the warhead could survive re-entry. But North Korea is close enough that it may not matter. All that matters is that the possibility of a North Korean ICBM is now so great that America must behave as if it is a known fact. And America is responding. The ICBM is the weapon that led President Trump to threaten North Korea with force, and which has now led him to accept an offer of a summit. The Trump administration says it is not prepared to accept that North Korea can have the ability to strike Washington, New York or Los Angeles with a nuclear weapon. It claims to fear that North Korea’s leader is so unbalanced that he might choose to strike the US at any moment. But of course that would trigger a devastating response from the US and there is ample evidence that Kim Jong Un is rational enough to avoid doing anything that would lead to his certain demise. The true significance of the North Korean ICBM is that it leads to a phenomenon among America’s Asian allies that strategists call “decoupling”. When North Korea can credibly threaten to kill hundreds of thousands of Americans in an instant, America’s allies start to worry that US guarantees to defend them in the event of North Korean aggression suddenly appear less credible. It is one thing to put America’s armed forces in harm’s way by basing them in Japan, South Korea and elsewhere within range of North Korea’s shorter-range weapons. But would the US really be prepared to risk Los Angeles to save Seoul? It is true that America has faced the decoupling problem before, and overcome it. In the 1960s, after the Soviets had acquired the means to strike American cities, Washington had to convince its NATO allies that it was still committed to Europe’s defence. Washington addressed this fear by basing smaller nuclear weapons on European soil and integrating NATO members into the command structure for these nuclear forces, thus knitting the allies closer together. Could the US do the same this time? The practical barriers to reintroducing US nuclear weapons to the Korean Peninsula are formidable, but it could be done. However, the problem is not practical, it is political. North Korea is not the Soviet Union. North Korea is not a global, existential threat to American interests and values. Far from being the leader of an ideological movement with global ambitions that is hostile to US political ideals, North Korea is an isolated and insular throwback, a vestige of the Cold War left behind by history. It has an economy roughly the size of that of Laos, and its conventional military capabilities – that is, its non-nuclear air, ground and naval forces – are second-rate. Without the Cold War to give the North Korea problem a larger context, Pyongyang is by all objective measures not very important, and America’s Asian allies – primarily South Korea and Japan but Australia too – all know it. That’s why North Korea’s ICBM is such a crucial development: it exposes the fact that America’s interests on the Korean Peninsula are not as significant as these allies may have hoped, and it no longer anchors the US to the region as it used to. Now, this claim relies on quite a narrow reading of American interests, much narrower than that taken by recent US presidents, and in policy statements which insist that the United States has vital stake in the Asia Pacific and that it must maintain its pre-eminent strategic status. American leadership, it is said, makes the region safer and stronger, and thereby makes America safer and stronger. America’s network of Asian alliances is a cornerstone of that leadership, so weakening one of those alliances at the hands of North Korea would be a blow to the US and the rules-based international order it champions. But how big a blow? During the Cold War, this question was easier to answer because America was engaged in a global struggle to defeat communism. This was the animating purpose behind America’s global network of alliances and military bases, including those in Asia. Then European communism collapsed, and America only found a new animating purpose on the world stage after the 9/11 attacks. But the fight against Islamist terrorism was never a strong motivating force behind America’s alliance commitments in Asia. Instead, this alliance structure persisted after the Cold War largely because there was nothing to challenge it. But in China, America now faces a true peer competitor in Asia. According to Australia’s 2017 Foreign Policy White Paper, by 2030 China’s economy could be worth $US42.4 trillion versus $US24 trillion for the American economy. And China will want to elevate its strategic status to match its economic status. China seems to have no immediate ambition to challenge America’s pre-eminent global military standing, but President Xi Jinping has made it clear that he sees China as a global model of governance and development to rival that of the US. At the very least, it is safe to assume that China will no longer accept being second to the United States in its own region. Just as Washington refused to allow foreign powers to dominate its immediate environment when it rose to great-power status, China will want the same in the Asia Pacific. So when America now asks itself how much it values its position in Asia, the issue is no longer abstract. It must now ask, “If we value this position highly, what costs would we be prepared to pay to defend it?”. Unlike the early post-Soviet period, the costs could be very high, because America now needs to defend its status against the largest economy in the world, a nation which is on track to building a navy on a par with the US fleet by 2030, which has “home ground advantage” rather than operating from bases on foreign soil, and which is highly motivated to displace the US as the leading regional power. When the question is put in those terms, the answer to whether the US benefits from maintaining its leadership position in Asia is suddenly open to more doubt. And it is far from clear that America is willing to pay the price of that leadership, which would require a sustained, multi-decade effort as least as intensive and wide-ranging as the struggle against Soviet communism. Yet unlike the Soviet Union, China presents no global threat to American interests and values; yes, it is an economic juggernaut with regional leadership ambitions, but it has no evident motivation to “bury” the US, as Khrushchev once threatened. It is also enmeshed in the global economy in a way that makes it impossible to isolate – or at least, not at an acceptable cost. So in thinking about its future in Asia, the US faces two juxtaposed problems: on the one hand, without the Cold War to give its military presence on the Korean Peninsula a larger justification, North Korea is really too small to be a core security concern for America; but on the other hand, China is too large, too important to the global economy, and too ideologically nebulous for America to challenge it in the same way it faced down Soviet-led communism. As distinctive as these two problems are, they point to the same solution: the United States should get out of South Korea. To understand why, we need to examine how America’s big problem (China) is connected to its little problem (North Korea). Of course, few serious American commentators support the idea that the US should pull its troops out, and some even advocate that, far from retreating, the US needs to reinforce its position by dealing with Pyongyang militarily – Trump’s new National Security Adviser, John Bolton, may be among them. But the consequences of military action in fact illustrate why the US should back away. There are a host of reasons why military action to deprive North Korea of its nuclear capabilities would be a bad idea, the most obvious being that it could quickly reach a financial cost and scale of destruction that would dwarf the Iraq invasion. The US may begin such a campaign with the sole intention of destroying Pyongyang’s nuclear infrastructure, but if North Korea retaliates by firing at Seoul, launching missiles at Tokyo or moving across the South Korean border, there is no telling where the escalation might end. A US Congressional Research Service report estimates that even if nuclear weapons were not used, such a conflict could cost the lives of 30,000 to 300,000 people. Of course such estimates are little more than educated guess-work, and maybe the US has the detailed intelligence, military plans and weapons systems to knock out Pyongyang’s nuclear capacity at perhaps half of the Congressional Research Service’s low-end estimate. So let’s assume 15,000 people perish in North Korea, South Korea and perhaps Japan during such a campaign, five times as many as died on 9/11 but among a smaller population. At the end, however, North Korea will have been disarmed of its nuclear capabilities. Would the US expect South Korea to be grateful for such an outcome? And what of America’s other friends and allies? They will no doubt be relieved that the threat has been diminished, but what other lesson would they draw? The US has consistently said that North Korea’s nuclear weapons program is unacceptable, and it has worked tirelessly through diplomatic and economic channels to persuade Pyongyang to change course. However, the United States has up to this point never argued that North Korea’s nuclear capability was so unacceptable that it was worth launching a war to prevent it. Were the US to change that position based on the fact that Pyongyang is close to deploying an ICBM, it would have placed hundreds of thousands of South Korean and Japanese lives at risk in order to reduce the threat to the US homeland. It would be the apotheosis of “America First”, and a crushing blow to Washington’s reputation among its allies. Moreover, even in the unlikely event that the US could disarm North Korea with “just” a few thousand casualties on its own side, solving this “little problem” does nothing to address the big one: China. America’s broader position in the region is under unrelenting pressure from China’s rise, and disarming North Korea by military strike would not save America from that challenge. In fact, the financial and human cost of such a campaign would raise China’s position relative to the US, just as the Iraq war did. China would also benefit from the dismay such action would cause America’s allies. A preventive strike might even drive Pyongyang into the protective arms of Beijing, thus relieving China of a stubborn problem and giving it more influence on the Korean Peninsula. This last point is critical for understanding how the US can negotiate its exit from South Korea on favourable terms. At the present moment, China benefits enormously from North Korea’s nuclear program. Because of “decoupling”, North Korea’s ICBM program erodes America’s alliances with South Korea and Japan, which is just what Beijing wants. Were America to decide on a more distant relationship with South Korea, North Korea’s nuclear weapons would cease to be a first-order national-security priority for Washington, yet it would remain a first-order problem for China. There is a tendency in the West to view the North Korea problem exclusively through an American prism. But the US is in Asia by choice, whereas China is North Korea’s permanent neighbour. If China became the pre-eminent strategic power in Asia, a nuclear-armed North Korea could be a serious and permanent irritant for Beijing. In fact, had China’s rise occurred in a world without North Korean nuclear weapons, America’s options would now be even less palatable. Speaking at a fundraising rally in Missouri recently, President Trump hinted that he was prepared to trade away America’s troop presence in South Korea: “We have a very big trade deficit with them, and we protect them … We lose money on trade, and we lose money on the military. We have right now 32,000 soldiers on the border between North and South Korea. Let’s see what happens.” Trump has also been consistently hostile to America’s worldwide alliance arrangements, arguing that America is exploited by its allies. As unconventional as Trump’s instincts are, they could be just right for these times, because America faces a stark choice: does it want North Korea to give up its capability to threaten American cities with nuclear weapons, or does it want to maintain its military presence in South Korea? It cannot have both, and unless it negotiates with Pyongyang, it may end up with neither, because the deadly combination of “decoupling” and China’s rise is gradually eroding the credibility of America’s presence in South Korea anyway. So if the Trump-Kim summit goes ahead, the US President should offer a trade: in exchange for North Korea giving up its ICBM ambitions, the US will permanently withdraw its troops from South Korea. The two sides could even agree to begin negotiations on a permanent peace treaty. To be clear, the US demand should be for Pyongyang to give up its ICBMs only, not its entire nuclear arsenal. Pyongyang would never agree to complete disarmament because its nuclear program is directed very much at its neighbours, not just the US. Total North Korean nuclear disarmament might not even be in American interests: it would remove a thorny problem for Beijing, and although an American retreat from the Korean Peninsula would be good news for China, there is no need for Washington to do Beijing any additional favours. 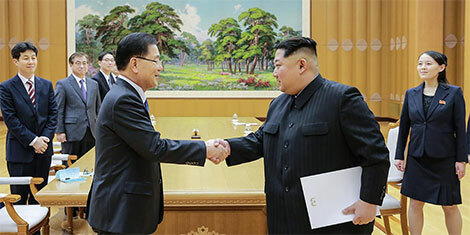 It is true that North Korea has a history of breaking its arms control commitments, and some will say that it would be almost impossible to truly verify an agreement like this. That’s true, but there would be little incentive for Pyongyang to cheat. Getting the US to withdraw from South Korea is probably why North Korea developed an ICBM in the first place. Why jeopardise the attainment of that goal with a clandestine program? Anyway, having reached a settlement with the US, Pyongyang wouldn’t need a long-range missile. All its remaining enemies would be close to home. This is just one summit and expectations are rightly low; the meeting may not even go ahead. But it is worth recalling the Reykjavik summit in 1986 between US President Ronald Reagan and Soviet General Secretary Mikhail Gorbachev, which was supposed to be no more than a preparatory event for a conference in Washington the following year. In the space of two days, the two leaders came within a whisker of a treaty that would have banned all nuclear weapons. Although that goal eluded them, Reykjavik still stands as a watershed moment in the Cold War, turning the US-Soviet power struggle on its head. As leaders, neither Kim nor Trump rise to the status of Reagan or Gorbachev. Yet Trump and Kim are nothing if not mercurial, so we shouldn’t dismiss the possibility of a grand bargain, whether at this summit or later. In fact, America’s allies should encourage one. Much is at stake. An agreement that leads to the removal of US troops from South Korea would be historic enough, but it would probably be just the first step in a broader US retreat from the region. Allies would get a clear signal from such a deal that America believes Asia is not worth fighting for. Regional confidence in the US would decline, and over time, the incentive for South Korea, Japan and eventually perhaps even Australia to develop their own nuclear capacity would grow. But thanks to China’s rise and North Korea’s ICBM, America’s position is eroding anyway, so the US needs to find more solid ground. The task, then, is to negotiate the most favourable terms for America’s retreat. America won’t disappear from the region entirely, and nor should we want in to. But the leadership of our region is in transition, and it is in the interest of America’s friends and allies in Asia that the US negotiates this shift from a position of strength. This article was originally published in the Australian Financial Review in March 2018. Sam Roggeveen is the Director of Digital and Senior Fellow at the Lowy Institute. Hope that rumors of war will end so soon. Leaders should know that it is more of control but of camaraderie and respect. Not power but a decision that makes sense.